Your body has 75 trillion cells, and they all depend on your heart to provide them with blood. In fact, the only cells that don’t receive blood are the cells in the corneas of your eyes. In order for a kitchen faucet to produce the same output as your heart during its lifetime, the faucet would have to be put constantly on full for at least 45 years. That’s about one million barrels of blood, which could fill up more than three super tankers. At the center of this incredible cardiovascular operation is the heart, a self-powered organ that works constantly to keep you alive. It is able to take a lot of abuse without stopping. In fact, it will actually grow bigger to try to help you stay alive longer. Despite your heart’s best efforts, it will eventually wear down. In fact, worn down hearts are the leading cause of death in the world. The good news is, if your heart is having a little trouble pumping enough blood, you can get a mechanical pump called a left ventricle assist device (LVAD). We mention the left ventricle device because the left ventricle is where each heartbeat starts (as well as heart troubles). Now, as you may expect, having a mechanical pump in your body can make life a bit more complex. 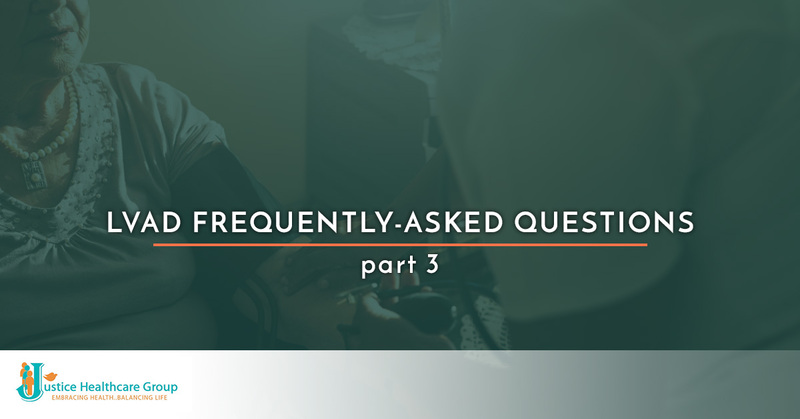 In our last blog, we answered a few questions about daily life with a LVAD and how we can help. Today, we will answer some more questions in hopes they will give you peace of mind if you’re heading for a LVAD. How will my LVAD change my daily life? Though everyone is different, there are a few things that LVAD patients can expect across the board. Firstly, things are going ot be different. You’ll have a new normal to adjust to. The LVAD will be constantly attached to your body, so some of your daily activities will have to adjust to accommodate it. In these modern times, LVAD batteries and parts are getting smaller, lighter, and more convenient, but you’ll need to sleep in a way that doesn’t put pressure on the LVAD. You’ll also have to remember that you’re under constant risk of infection. All the changes won’t be negative! Over time, you’ll realize you have more energy and don’t get short of breath as quickly. You’ll be able to drink plenty of liquids (and be encouraged to do so). You may feel some dizziness if you haven’t taken in enough fluids or the weather is hot. Generally, you can solve the dizziness by drinking water and moving slowly. Can I operate a vehicle with a LVAD? The only limitation you’ll have when it comes to driving is recovery from the implantation surgery. The LVAD itself won’t prohibit you from driving at all. Stay connected with your doctor to know when you’ve healed enough to drive. You can be a passenger at any time. As you might imagine, blood pressure is incredibly important when you have a LVAD. Because of the therapy a LVAD produces, it can be difficult to read blood pressure with commercial blood cuffs. You may have to get your blood pressure checked at your physician’s office. This is where we can help! We have trained with LVADs and know how to get accurate blood pressure readings. You won’t have to visit an office because we come straight to your home! Justice Healthcare exists because life is too short to spend it going back and forth between home and the hospital. Our home health aide team brings professional medical care to your doorstep, empowering you to recover quickly and live the best life. Contact us in Texas today!